Think of a decision that changed your life, your most dizzying romance, a smell that steeps you in nostalgia. How old were you when those memories were born? If your answers fell between 10 and 30, congratulations! 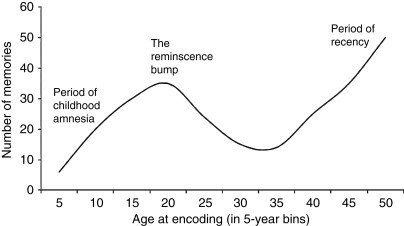 You are proof-positive for the existence of the reminiscence bump. At 10, you should identify your favorite subject in school and pick up the hobbies that you will master later in life. Between 16 and 18, you should collide with a star-crossed lover. In your early 20s, you should find true, lifelong friends at college. Your late 20s should be spent finding a way to merge your favorite school subject and hobbies into a career. Then you should get married and start having kids. After you get married and have kids, your life should go into “happily ever after” mode…leaving you with nothing much to do but balance your checkbook and reminisce. Are life scripts bad for us? So what do books have to do with all this? Most of the books that we read (and write!) are focused on 10-30 year old characters. These characters reinforce our life script and train our minds to focus on the days of our youth, thus feeding into the reminiscence bump. But there is an alternative. By reading and writing books about older characters, we open ourselves up to the possibility that we can fall in love, embark on an adventure, launch a new career, or change who we are at any age. Water for Elephants exposes the reminiscence bump at its worst: preying on the mind of a man whose action-packed youth has fallen into a slump that he detests. All I can do is put in time waiting for the inevitable, observing as the ghosts of my past rattle around my vacuous present.They crash and bang and make themselves at home, mostly because there’s no competition. Sadly, we don’t see Jacob accepting a hand out of his slump from any of those ghosts. He continues feeling disoriented and dissatisfied right up until the “inevitable” end. Now that you’ve been properly frightened by Jacob’s fate, let’s take a look at his opposite: Bilbo Baggins. Sorry! I don’t want any adventures, thank you. Not today. Good morning! But please come to tea–any time you like! But in the end, his “Tookish” side wins over, and he abandons his cozy hobbit hole (as well as his cultural life script) to go adventuring with the dwarves. Celie has a rough–but not atypical–beginning in life. She is shuffled from an abusive father to an abusive husband, doing her best to hold onto her own morals and values. Then, in the middle of her life, when her fate is supposed to be settled, she meets Sugar. Sugar liberates Celie from her life’s script, helping her explore her sexuality, leave her husband, move to a new city, rethink her religion, and start a new career all as a middle-aged to old woman. I am an expression of the divine, just like a peach is, just like a fish is. I have a right to be this way. When the Ghost of Christmas Past arrives to shepherd Ebeneezer Scrooge back to his “golden years,” Scrooge is not happy with what he sees: the opportunities for happiness that he missed while he was pursuing a life script to wealth. I wear the chain I forged in life. I made it link by link and yard by yard. I girded it on my own free will, and of my own free will, I wear it. What makes Scrooge remarkable is that he acts on his regrets. As a 60ish-year-old man, he changes his directive in life and re-invents himself in a way that makes him much happier. Seventy-two year old Daisy Werthan is not happy when her son informs her that she will have to rely on an African American chauffeur for the remainder of her travels. Hoke, the chauffeur who Miss Daisy treats with disdain, is equally unenthusiastic about the new arrangement, although he does his best to hide it from his employers. Still, the time they are forced to spend together reshapes both Miss Daisy and Hoke. Miss Daisy surrenders her prejudice. Hoke learns to read and write. And both of them gain the friendship of a lifetime. What’s the most inspiring thing you have seen an older person do? I’d love to hear about it! Like potato chips, it’s never just one…. my fellow Eldritch Ones amaze me most when they rise above those very scripts that have run their lives for so many years, stand up despite all potential costs, and say what they’ve been thinking but never said for fear of offending the status quo. In other words, it is learning that in order to be true to oneself, one needs to do what is right — not what is expected, and that conformity is the real cowardice. I love this blog…well, until I got to the last line and read…”inspiring thing you have seen an OLD PERSON do? My first reaction was to burst out laughing! :-). OMG, I’m two years from 70…so how am I supposed to respond to this…? If I’m the “old person” in question, then my answer would be…got married-started a novel–I guess. I think, and this is something I’ve put some thought into, my age–my life experience–is a positive force in my writing. I can, simply put, draw on past experiences. As I move into the mind of my young characters, I–imaginatively–become young with them, that is, I laugh with them at things I, the 68 year old author, would not laugh at. The question: Does my age actually block or resist the youthful mind/experience, and I’m not aware of it? I can say no, because of outside reader responses to my writing. I have received positive feedback that my characters, male and female, are not old folks in young peoples’ bodies. I firmly believe this is an issue for the aging writer. Does the best time to write about a 60s or above person occur when one is twenty-eight years old? My answer to that is similar to my feelings towards “life scripts.” My answer is “not necessarily.” One must resist being locked into a “script.” The horrifying truth is that most people do allow themselves to become imprisoned in such. Their lives become a cliche. Actually I do have an answer for the number two question: I’ve been writing since I was a senior in high school. I haven’t written a novel because I had to wait. It was my karma. One month later, I’m finally responding to your comment! Again, sorry for the lag! I’ve been travelling and adapting to some new responsibilities on my plate. I can definitely see where 68 years of experience would be an asset in writing. As the golden rule goes, we must write what we know–and as we get older, we simply know more! Provided, that is, that we are able to keep the memory of all our experiences alive. For me, that is already proving to be tricky. I have trouble writing dialogue for children, trouble restraining myself from inserting philosophical observations when they don’t jive with my character’s age. (Sounds like you are doing a better job at that than me!) At the same time, I think the age challenge is one of the joys of writing. It gives me a legitimate reason to mull over days gone by. It helps me make sense of how 22-year-old-me rose from younger me’s, gives me a sense of continuity, helps me keep the memories alive (even though I’m not a biographical writer). Thanks again for your insight! Glad you enjoyed the post!